Yesterday, the developer behind Flappy Bird said he would be removing the remarkably/mysteriously successful game from the App Store in just 22 hours. Sure enough, the game appears to be gone. And in its spot on the #1 spot on the iOS leaderboard? A Flappy Birds clone. Flappy Bird’s developer, Dong Nguyen of Vietnam, suggested that the many pressures of success had become overwhelming. He later followed up to clarify that the game was not being removed for legal reasons, nor would he sell Flappy Birds to someone else. According to an interview with The Verge last week, Dong Nguyen disclosed that the game was making upwards of $50K per day in ad revenue. Many internet commenters had suggested that the tweet was something of a ploy to bump downloads up even higher; that Dong would have a “last minute change of heart” after the tweet lead to a surge of downloads and further secured the game its #1 spot. Given that the game is seemingly gone from both the iOS and Android stores (with a million clones left in its wake), that doesn’t appear to be the case. 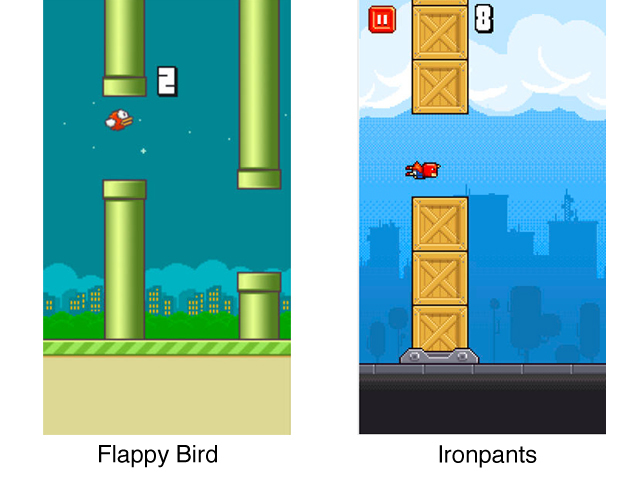 The strikingly-similar game that now takes its place aboard the iOS App Store’s free games chart is called “Ironpants”, and the concepts are essentially identical: You’re controlling a flying thing. Tap to make flying thing go up. If your character touches anything, you lose. You’re a superhero instead of a bird, you’re dodging crates instead of Mario-inspired pipes — but at its core, it’s pretty much the same game. The main difference I’ve noticed so far: the ads are significantly more in-your-face. Could the bird return, if Nguyen does decide to bring it back? It’s feasible. It depends on how it was “removed” from the App Store. If the app package was removed from iTunes Connect entirely, Nguyen would need to resubmit it and wait for Apple’s approval, and it will have lost its previous download count, reviews, etc. If he just turned off its country-by-country availability, bringing the game back could be a matter of ticking a few check boxes. If you’d downloaded Flappy Bird before it got the self-dropped App Store ax, you should still be able to download it indefinitely if you ever delete it from your phone. The download button will be hiding in your iCloud “Purchased” list, which is in turn tucked away into the Updates screen in the app store.